This compact countertop distiller produces a 1 gallon batch of clean, pure water in just 4 hours! Providing enough water for up to 4 people, the 4000 requires no assembly or installation and is as easy to use as a coffee maker. Simplicity by design makes the 4000 simple in operation! Just fill the stainless steel boiler with ordinary tap water and plug into any standard electrical outlet. Then push the start button and walk away. The 4000 stops automatically when the cycle is complete. With its clean lines, powder-white finish and space saving size, the Waterwise 4000 will compliment any kitchen decor. The Distiller 4000 comes with a 1 gallon Glass collector/storage bottle which fits easily inside your refrigerator. For travel convenience, the bottle goes inside the distiller! This unique portable design is ideal for RVs, campers, mobile homes and dorm rooms. The 4000 is available for all worldwide electrical requirements and includes a detachable power cord. The Waterwise 4000 virtually pays for itself when compared to bottled water purchases and eliminates the inconvenience of lugging cumbersome bottles home. Included with the 9000, is a 1 gallon glass collector/storage bottle which fits conveniently into your refrigerator. 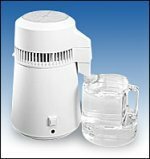 For families of 3 or more, or for the convenience of purified water on tap, the Model 7000 is for you. With one simple water connection, this fully automatic, high output distiller produces up to 9 gallons of pure distilled water in 24 hours. With this plentiful supply, you never have to worry about running out of purified water.